There are two kind of encryption/decryption methods in cryptography. One is Symmetric Encryption and the other is Asymmetric Encryption. The difference is very simple: Symmetric Encryption means we use the same key for both encryption and decryption. As long as A and B have the same key, A encrypted the data by the key and B decrypted by the same key. This way, A and B can talk to each other without letting anyone knowing the content. Even though someone is eavesdropping, the person cannot decode their message as long as the person does not know their key. What can go wrong here? Before you communicate to each other secretly, you need to at least once tell others the common key you are about to use. What if the first communication is eavesdropped? A man in the middle will know your key and can decrypt anytime. Worst of all, the person can decrypt and modified the content, then encrypt again without letting you know. Asymmetric Encryption, which mean a key pair have two keys. A public key and a private key. You can use public key to encrypt and private key to decrypt. You can also use private key to encrypt and public key to decrypt. This is the most important part of this article so it worth to mentioning three times. Period! Even if the communication is eavesdropped, nothing will be leaked as long as B’s private key is not known by anyone else. Main idea is to use the attribute that we can use public key to encrypt. And you have to use private key to decrypt if you encryped by public key. So I have nothing to worry even if my public key is leaked. As long as I keep my private key safe(In this case, private is never transmitted), no one can intercept the message. Why this approch solved previous problem? Because our first communication only exchange the public key, so even if public key is intercepted by man in the middle, he can do nothing with the public key. It is a foreshadowing. I will come back to this later. It is first time in your life you saw a foreshadowing is indicated itself a foreshadowing. That is the reason this article is unusual and outstanding. The story continues, since everyone has B’s public key, everyone can use B’s public key to send secret message to B. How can B knows who sent the message to him? If A claimed A sent the message, how can B know it is indeed sent by A not others? Now we introduce digital signature. Time to conclude everything, if A needs to send message to B, how to make this message seen only by B and B can ensure it is written by A? What if there is a “god in the middle”? The Asymmetric Encryption can break! 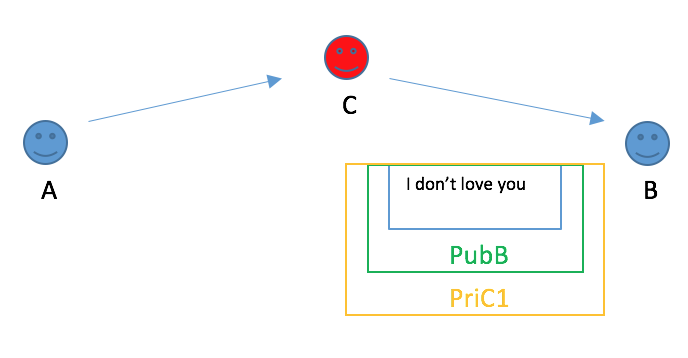 1.When A is sending A’s public key to B, if C intercept, C can take his public key and create another public/private key pair, give public key(C1) to B and told him it is A’s public key. 2.When B is sendind B’s public key to A, if C intercept, C can take his public key and create another public/private key pair, give public key(C2) to A and told him it is B’s public key. 3.A and B thought they hold each other’s public key. 5.C use A’s public key to verify and use private C2 to see the content, then modify the content as he want. We will discuss how to prevent man in the middle attack in next article.